Specialty Steel Works Inc. recently announced it will be making a multimillion-dollar investment into its Niagara LaSalle Corp. Cold Finish Steel Bar facility in Hammond. HAMMOND – Specialty Steel Works Inc. announced Sept. 7 it will make a major capital investment at its Niagara LaSalle Corp. Cold Finish Steel Bar facility in Hammond. The company did not disclose the specific amount but said the multimillion-dollar investment will include new high-performance equipment and infrastructure, which will enhance the Hammond facility’s operating capabilities. 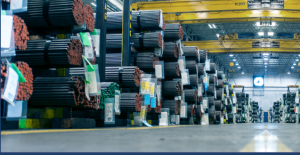 The Hammond facility processes cold finished steel bars in a wide range of sizes, shapes, grades, finishes and tolerances for numerous applications in the transportation, industrial equipment and agriculture markets. Joel Hawthorne, CEO of SSWI said the investment is part of a strategy to build a sustainable portfolio of assets across the company’s operational footprint. “Our ability to find innovative solutions is a competitive advantage that helps position the company for future growth,” he said. The company said the new equipment will be phased in during the next year months and will enhance the long-term viability of the Hammond facility.